The Euro fell at the start of European session on Thursday and erased all gains of recovery rally in Asia, in attempts to extend Wednesday’s strong fall (the pair was down 0.6%). 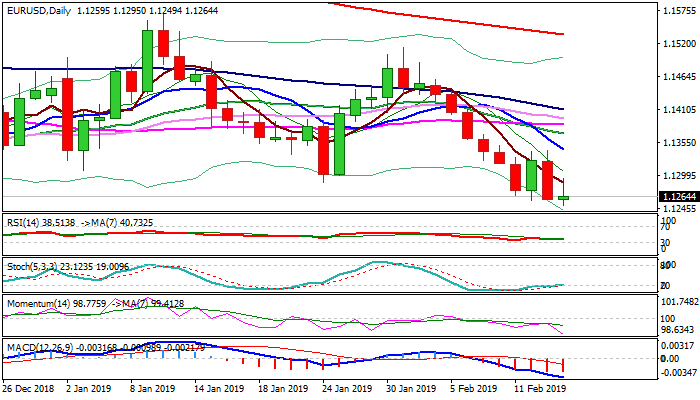 Wednesday’s bearish outside day adds to negative outlook, as bears took out the last obstacles on the way to 1.1215 target and key m/t support (12/13 Nov lows). Daily MA’s in full bearish setup and momentum in steep descend support scenario, but stochastic reverses from oversold territory and may slow bears. Falling 5SMA caps today’s action for now and marks initial resistance at 1.1288, with stronger upticks expected to stall under 1.1340 (tops of Wed/Tue, reinforced by falling 10SMA) to keep bears in play. Only sustained break above the latter would weaken bearish structure and signal possible stronger recovery towards plethora of falling daily MA’s (20/55/30/100) at 1.1369/1.1410 zone.